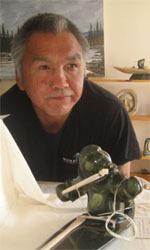 Jacko is a northern Labrador Inuk carver who has emerged in middle age, as an artist of renown. 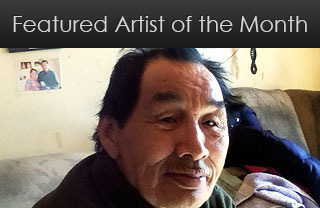 Born in Nain in the late 60s, he has retained his language (Inuktitut), culture and on-the-land lifestyle. Jacko seems to be a born carver and his easily-recognized stout serpentine drumdancers and hunters emerge from the stone, fully-formed and in-motion. 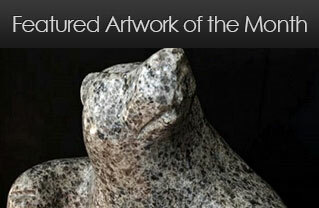 Most of his work is done from northern Labrador's jade-like serpentine, from whalebone and from caribou antler. Although shy and retiring, Jacko enjoys showing his work to interested onlookers, and is always pleased when he can instruct younger men and women who wish to try their hand at the art of carving. 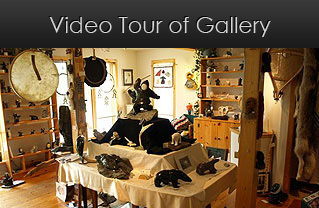 Here is an artist who demonstrates great innate talent and love of his art.